Digite o email utilizado na sua conta. Uma nova senha será enviada para você. "Forget about programmers, designers and artists. With us, everything is automated, simple and quick." 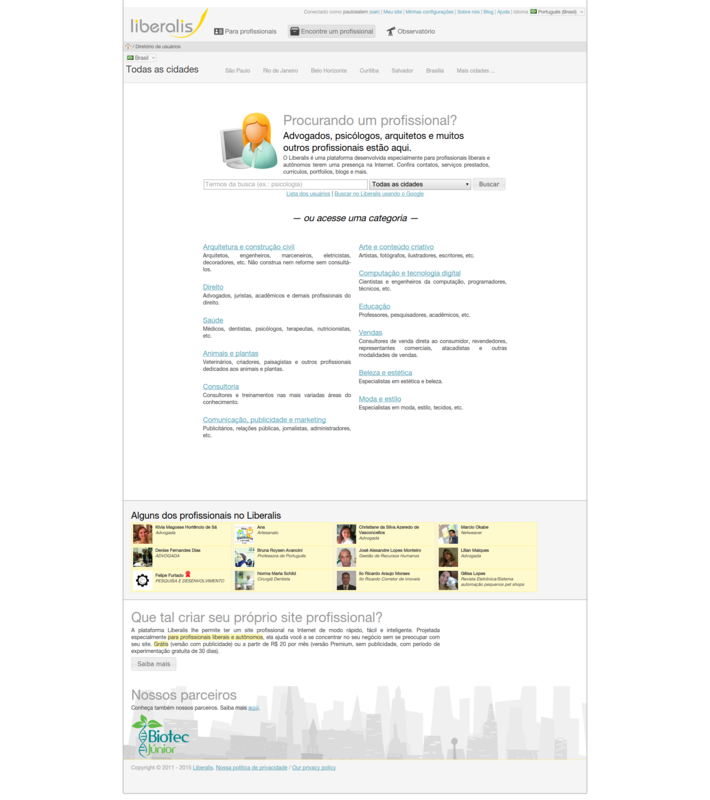 This was the aim of Liberalis, a system through which liberal professionals and contractors could create a professional site on the Internet in an quick, easy and intelligent manner. It followed a freemium model: there was a basic free version (with ads) and a payed premium version (without ads and including other benefits) starting at R$ 20 per month. Although we had a good technology, unfortunatelly the product turned out to be commercially unfeasible and therefore it was shutdown. 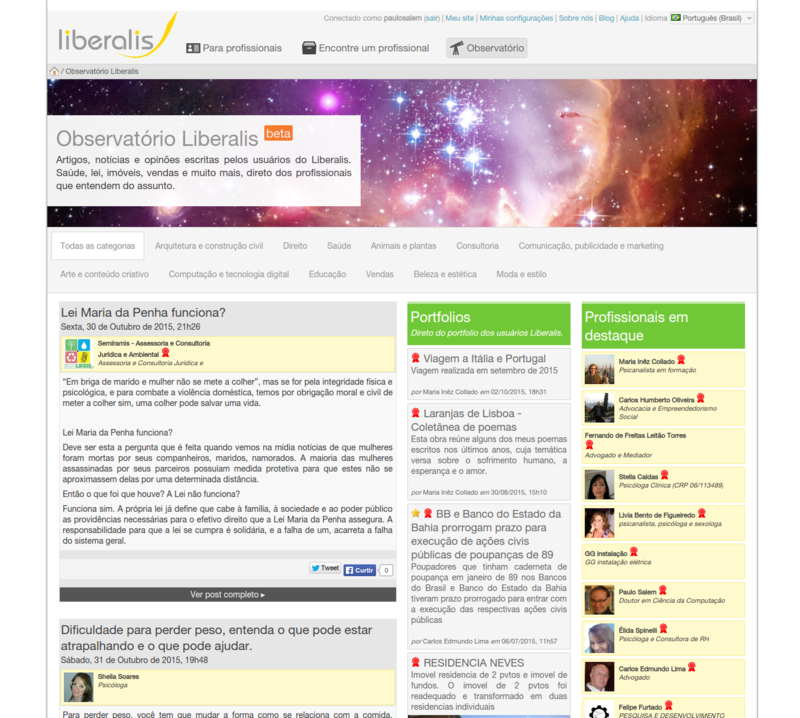 This page is now a memorial to show a little of what Liberalis was. To the curious, here are a few images: homepage, user profile, user profile with a different theme, users directory, user category, observatory (area with various users' contents). 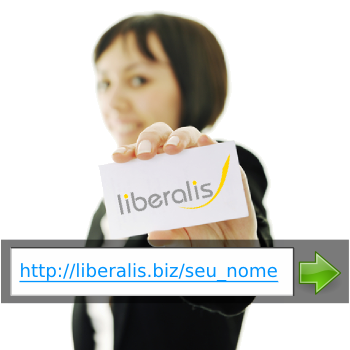 We can be reached through liberalis@liberalis.biz. Create an account, access your control panel and provide some information. In this manner, you can list your services and contact information, setup a portfolio, show your CV, among other things. You are not required to design anything! Just by providing these information, our systems automatically generate your site, so that it can be accessed immediately. And you can provide only the data you want, our platform is smart enough to adapt itself to the precise amount of information that you wish to convey. No technical or artistic knowledge required: we provide everything automatically, you just have to fill a few forms telling us about your professional activity. Made for professionals: a solution designed to help independent professionals, as well as small offices. Sober and professional design: convey trust and respect to your customers. Be found: your current and potential customers will be able to find you easily on the Internet. Constantly evolving: your website will always benefit from the technical upgrades that we implement in the Liberalis platform - automatically, with no added cost. Affordable: start with a free Basic account, for as long as you wish, and have the main benefits of Liberalis. If you desire to remove the ads from your site, as well as to enjoy exclusive tools and features, you can upgrade to our Premium plan (free to try for 30 days, and then starting at only US$ 20 per month if you want to continue). List your services. You can list each of your services individually, and even include their price if you want. Curriculum Vitae. Show where you have worked and studied, your skills, the languages you know and more. Contact information. Define addresses, phones, emails and other websites. 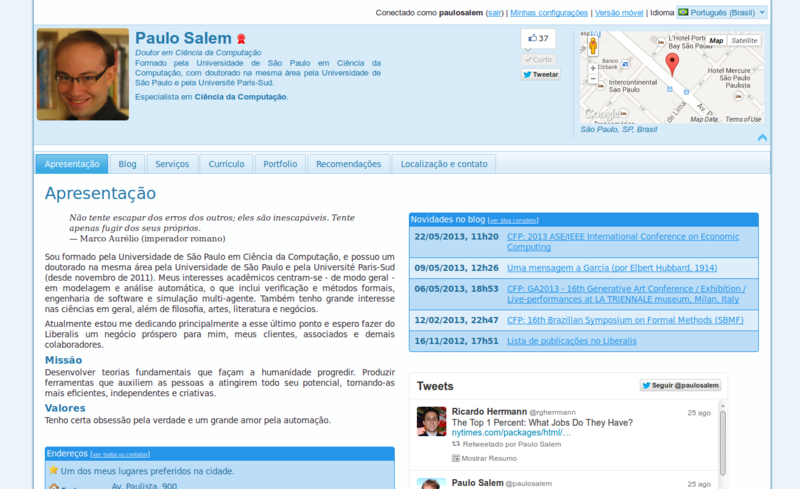 Your visitors will also be able to send you messages right from the site itself and see the addresses in a map. Blog. 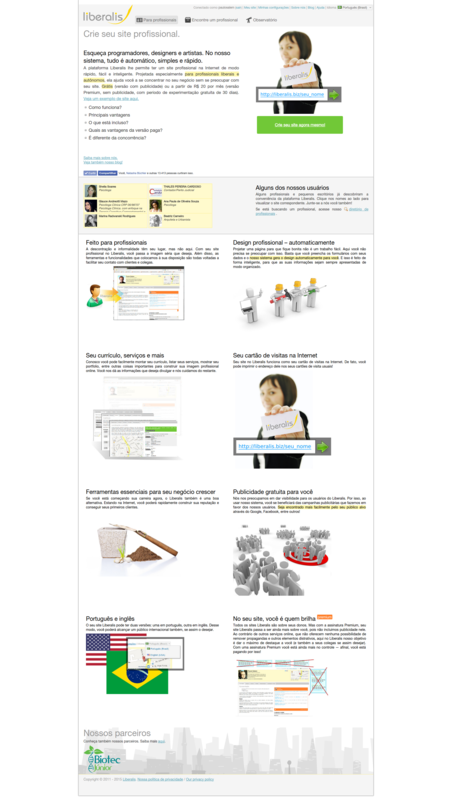 Publish news and articles on your Liberalis blog. Keep your customers updated about the latest news and tips from your professional area. Portfolio. Add as many portfolio works as you want, so that your visitors may discover what you have already done. For each work, you may also include files (such as documents and images), dates, and information about whoever hired you to do it. Recommend colleagues and companies. Recommend other people and companies that you think are relevant to your customers. You can recommend both Liberalis users and external entities. 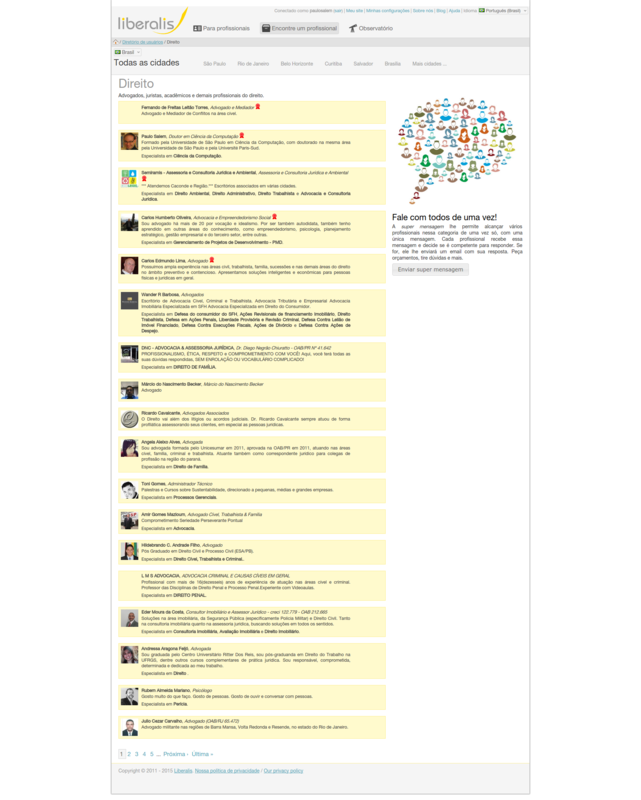 Mobile version (for phones and tablets). Smaller devices, such as phones and tablets, require special consideration when designing a website. Using Liberalis, not only you get a regular desktop site, but also a special mobile version — generated automatically, with no extra effort. Integration with Facebook and Twitter Visitors may like your site on Facebook and share it on Twitter with just a click. This helps you to reach even more customers. Was it different from the competition? Our focus is in the liberal, independent, professional, as well as small offices — not in medium and big business. This means that we offer features needed by this specific audience, which often do not exist in an integrated form elsewhere (such as services listings, portfolio and CV). We help our users mainly to find customers, not employers. We are not a job search site, but a platform for service providers. Other websites use your profile to profit from advertisement without offering you a way out, which may trouble some professionals. At Liberalis, we give you the option for upgrading to a payed Premium plan, in which no ads or other distractive elements are included in your pages. Here, you are the star! Copyright © 2012 — 2016 Liberalis.